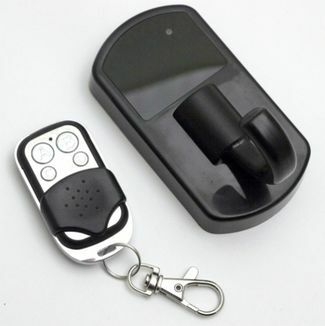 The Hidden Camera Hook DVR with Remote disguises a high quality DVR in a simple clothes hook. A common household organization tool, it can be hung prominently on a wall in any room to help keep track of keys, lanyards or light outerwear. The hook is easily mounted to the wall by the included mounting hardware. Simple to operate. A simple on off switch is hidden on the backside of the hook. Flip this switch to on and when fully charged the camera is ready for your command with the included wireless remote. High resolution color video. It is hard to imagine that camera fits in this every day black hook that takes 1280 x 960 resolution video at 30 frames per second. The hook doesn't even weigh noticably more than one without a hidden DVR. The HCHookHD supports MicroSD cards up to 16GB. Recording time. Record up to two hours continuous footage.